Even when your engine is working properly, automotive components can slowly start to wear down to lower performance levels. Meineke Car Care Centers offer auto tune up services when you need them. In Need Of A Tune-Up? What Happens in a Car Tune Up? Your engine uses a series of interconnected components to deliver a spark, send fuel, and push airflow into the engine. If the controlling components wear out and fail to provide those three necessary elements, your engine will not properly complete the combustion cycle. To ensure your engine receives air, fuel and spark all at the right proportions, the skilled automotive technicians at your local Meineke Car Care Center can perform a tune up service on your vehicle at regular scheduled intervals. Details of an auto tune up service will include replacing the cap, rotor, spark plugs, wires, and PCV valve. Technicians will also double check to verify if your car requires air, oil, and fuel filter replacement. How Often Should I Schedule an Auto Tune Up Service? To determine the best interval for regularly scheduled maintenance, your technician will first check the schedule provided by your vehicle manufacturer. After your tune up is performed, the technician can then determine the ideal timing for your next service appointment and provide a mileage number or date of when you should return. Following the maintenance schedule for your vehicle model and engine type will help protect your car from engine misfires and other problems that could develop over time if left untouched. Your technician will start the tune up process by removing and inspecting worn parts. A close inspection of the cap, rotor, and spark plugs can help technicians preemptively identify problems deep in your engine. Often, technicians must completely replace each of your worn components with brand new parts to restore the function of that system safely. Coming In For Your First Car Tune Up? Any time you notice hard start issues or declining performance, it is best to visit a repair shop and have a professional take a look. Often, it can be something small like a simple part replacement to restore the expected functionality of your vehicle. A trusted Meineke technician can provide you with a car tune up list and cost estimate for your vehicle’s specific needs. Q : Why do I need a car tune up? No matter what type of car you drive, a car tune up will extend the life of your engine. It will help catch little problems before they become big problems. Q : Are there any signs my car may need a tune up? While car tune ups are usually regular, scheduled maintenance work, there are some signs that indicate your car really needs a tune up. These may include your engine stalling or running roughly, seeing a decrease in your usual mileage or a car that’s tough to start. Q : I heard a car tune up can improve gas mileage. Is it true? Yes. The bottom line is that clean air filters burn less gas and a proper tune up can improve your gas mileage by 4%. Q : What parts are required for a car tune up? During the tune up process, the technician removes and inspects a range of parts, including cap, rotor, spark plugs, wires and PCV valve, as well as air, oil, and fuel filters. These will be checked for worn signs and a determination will be made as to what needs replacing. Q : How much will a car tune up end up costing? Every car is different in terms of age, mileage and maintenance history, all of which affect the tune up process. Some vehicles may require a deeper analysis of engine components, while others may only require a few parts to be replaced. 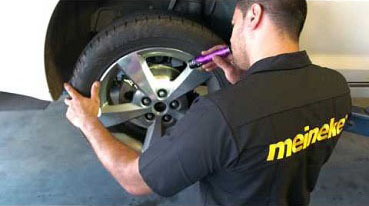 An experienced Meineke technician will provide you with an overview of the inspection, an outline of necessary work and an estimate of the costs. Q : What are the benefits of a car tune up? Not only does a car tune up help improve gas mileage, but it also extends the life of your vehicle. Tune-ups performed regularly keep your engine in top shape, improving its performance, therefore reducing the risk of a car break down. To top it all up, a well-maintained engine can help you reduce your carbon footprint, as it emits a lower level of toxic fumes.